Iqmiutauluni. (It is a snuff box.) Nutaraunganani. (It looks recent.) It looks also like a box for tobacco iqmik (“to have something in the mouth,” meaning chewing tobacco). Many men and women used tobacco in the form of snuff - finely chopped and sifted leaves that they took into their noses through an ivory tube or the wing bone of a goose. They also chewed tobacco that had been mixed with the ashes of birch tree fungus, coltsfoot, butterbur, willow, and other plants. 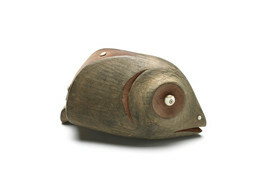 People carried their supplies of snuff and chewing tobacco in small wooden boxes, often carved to represent animals. This one is probably a fish, with gills on the sides. The beauty of carved snuff boxes reflected the value of their contents. Joan Hamilton: Iqmiutauluni [It is a snuff box] . . . It also looks like a tobacco iqmik [to have something in the mouth], it is actually something you keep in your mouth. It’s not always chewing tobacco, but it’s become that . . . It’s like tuunrangayak [spirit], now they interpret it as devil, but it actually means ideology of some kind of illness . . . . They would make these imitations of something that, some kind of animal, fish . . .
Aron Crowell: Apparently, they told Nelson this was a porcupine. Nena Rivers: Taryaqviim . . . . Caunguarit, caunguaraqapigtevkenaki tunganaqerluki pilituut. Joan Hamilton: But the coloring is perfect, you know. It’s really admirable . . . . Iinga caullrua?